This just makes so much sense, Steve. Not that there’s no role for formal training — but as Tom Gilbert, Geary Rummler, and lots of other people kept telling us, the key is to work backwards from the results you want, through the processes that produce those results, to the factors that affect those processes. Skill and knowledge can and often do have an influence, but so do many other things: tools, job aids, work design, feedback systems, motivation and incentives. This post has me going in so many directions I can scarcely make a coherent comment. Yes, I 100% agree with this idea of the “nudge” at the right time. I work as an instructor teaching students to become entry level Licensed Practical Nurses. They are required to attain a competence level, for skills but are not “masters” at the skills. The students are taught in the classroom and have simulated nursing labs, but often is not until the students experience the actual “clinical site’ floor time that the students have that “Ah-Ha” moment and actually are able to develop beginner competence in the skill. The clinical experiences are “indelible” experiences, many students carry these memories for years post-graduation. 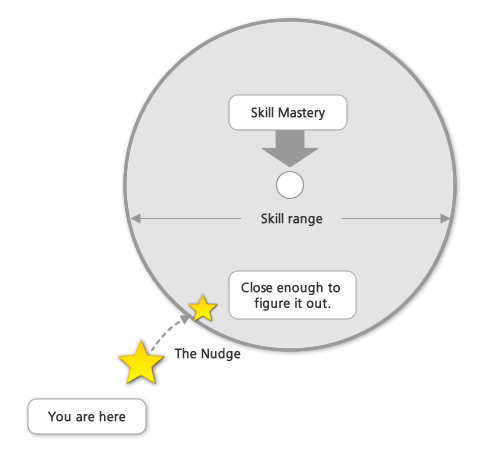 The range of skill and mastery of the skills develop with actual practice. The numerous designs of presentation of lessons is important but nothing is better the actually “hands on” care and face to face interactions. Pingback: #mLearning: How to create engaging training videos with PowToon | "Creative Design of Learning Experiences"
Love this! Especially “Instructional perfection is a unicorn. A mythical creature. The effort expended to reach it is not only wasteful but probably defeats your design purpose. Design for nudges and watch deliberately from a distance. Time spent connecting your learners with just what they need…” I need to be reminded of this every day.